This recording is a charmer but not an essential purchase. It is beautifully crafted, gentle music, and, at least in the Quartet, something of a curiosity. 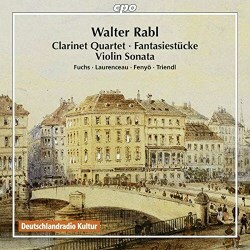 Walter Rabl was perhaps best known in his lifetime as a conductor, though his quartet has maintained a small hold in the repertoire – there is a rival recording, coupled with a quintet by Josef Labor (Cedille CDR90000088) by the Orion Ensemble. The curiosity is the instrumentation – clarinet, violin, cello and piano. I know of no other work with this combination until it was used by Hindemith in 1938, and more famously, in Messiaen’s Quartet for the End of Time. In Messiaen’s case, the instrumentation was determined by the musicians available in his prison camp. In this instance, the instrumentation was deliberately chosen for a competition initiated by the Vienna Tonkünstlerverein. The 1896 competition was for chamber works that included at least a single wind instrument. Brahms was patron of the organization, and on the jury. He found the piece admirable, it won first prize, and Brahms recommended Rabl to his own publisher, Simrock. The piece was published with a dedication to Brahms. The circumstances tell us something about the music. One can see why Brahms was so impressed. There is a delicacy especially evident in the second and third (of four) movements. Rabl has both technical proficiency – nothing outstays its welcome – and a wonderful ear for the distinctive characteristics of each instrument and also for how they might blend. Nothing hurts the ear but charm and technically assured construction do not make great music. Nothing threatens or pushes at the boundaries. This is comfortable, assured music, in a conservative idiom, to my ear more Schumannesque than Brahmsian. The same qualities are apparent in the Fantasiestücke, eight delicate pieces between one and four minutes long. Again, the episodes that linger most in the memory are the shorter ones. The Sonata, Op. 6, published in 1899, is perhaps the most Brahmsian of the three works. The two instruments are treated as equals – the piano is not just accompaniment. The writing is virtuosic, varied – there is a charming waltz in the third movement, and the final movement has aspects of a nursery rhyme. Performances are excellent – the players are experienced chamber players. The recording is clear, but raises an interesting question for the listener. The recording was made in late December, and at least one of the musicians, had a cold, leading to some heavy breathing and at least one quiet cough. I was not distracted, but someone who preferred a clinical studio recording might well have been. Rabl gave up composing altogether by 1903. Perhaps he knew his limitations.